Packed with outstanding power, unmatched quality and value, Ford has further enhanced its capable compact SUV with the introduction of several first-in-segment and best-in-class features and premium styling. said Nigel Harris, president and managing director, Ford India. Ahead of the festive season, we have made our clever, compact SUV even more stylish with a host of smart features and enhanced power to delight consumers. The all new Ford EcoSport delivers on Ford’s commitment to bring global products and technologies to Indian customers and follows recently introduced compact sedan Figo Aspire as well as 2nd generation Figo hatchback. The new EcoSport comes with Ford’s trusted, refined and highly efficient 1.5L TDCi diesel engine with an improved peak power of 100 PS (73.8 kW) that delivers an outstanding mileage of 22.27 Km/L. The improved and more powerful diesel motor will be strapped to a five-speed manual transmission. The new EcoSport also introduces an all-new competitively priced, Trend+ variant with globally acclaimed EcoBoost technology to give the power of choice to Indian buyers. Recipient of four consecutive International Engine of the Year awards, the EcoBoost engine produces 125 PS of power yet delivering a class-leading fuel economy of 18.88 Km/L and emits 15% less CO2. The EcoBoost engine delivers power and performance of a traditional 1.6-litre engine with an improvement in fuel economy by up to 20 percent. The new Trend+ variant will be offered with a choice of 1.5L TDCi diesel engine as well. Offering greater choice, the new EcoSport also gives an option of Ford’s fun-to-drive 1.5L TiVCT petrol engine that delivers 112 PS of power and fuel efficiency of 15.85 Km/L. The petrol engine will be paired with both five-speed manual transmission as well as Ford’s renowned six-speed dual clutch PowerShift automatic transmission. 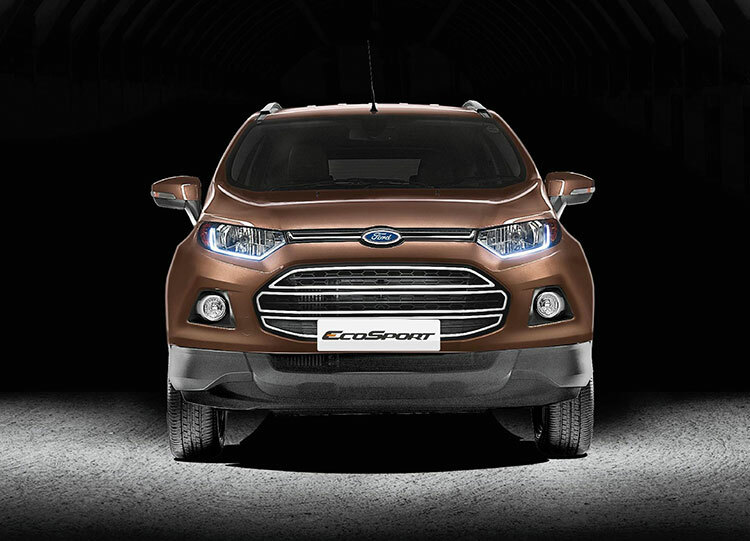 Accentuating its aggressive stance, the new EcoSport’s bold and dynamic front fascia will be complemented by the addition of signature light guide. The vehicle will also feature daytime running lights/fog lamps that bolster its premium appeal. The sporty yet premium interiors of the EcoSport receive a further boost with chrome treatment on inner door handles, cluster ring and cluster applique, window regulator switches and air register tabs. Extra attention has been paid to enhance the appeal of oft-used surfaces, such as handbrake lever and steering wheel, with abundant use of leather. 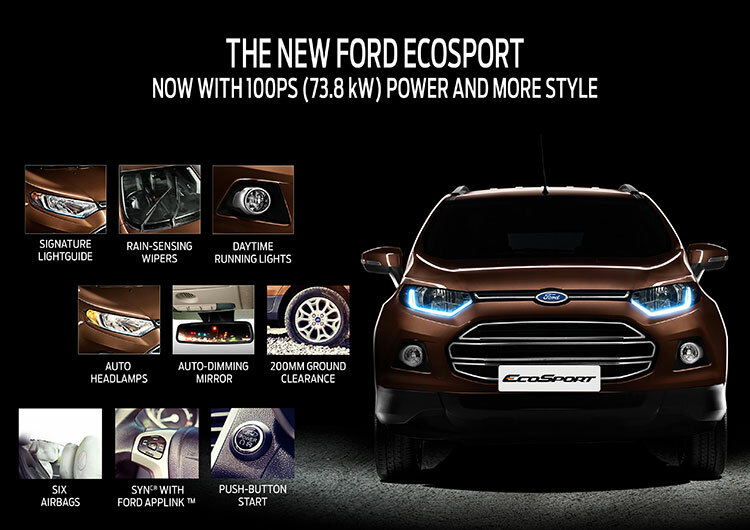 The EcoSport will have comfortable and plush premium leather seats. The new EcoSport makes customer convenience a top priority with its class-leading intuitive features like rain sensing wipers and automatic headlamps. The new EcoSport also introduces electrochromic mirror that automatically deflects a beam of light from trailing vehicles to minimise obstruction to drivers. 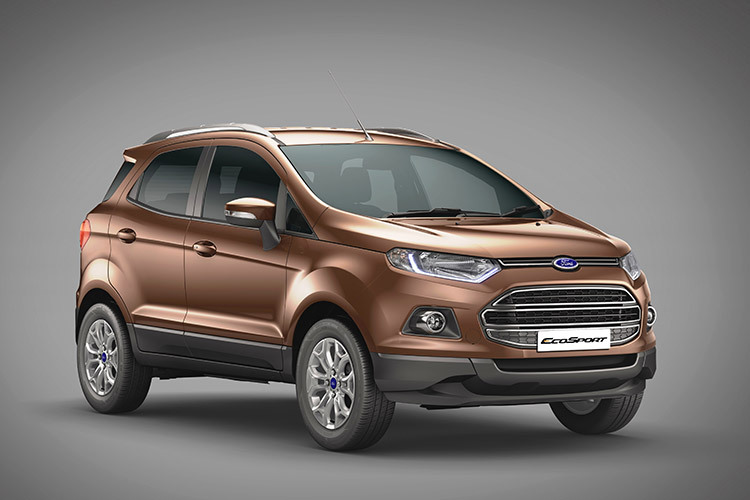 In line with the festive colours, the new EcoSport introduces a sophisticated and elegant new colour – Golden Bronze and is now available in 8 exciting colours including Mars Red, Diamond White, Panther Black, Kinetic Blue, Moondust Silver, Chill Metallic and Smoke Grey. About half of the compact SUV’s body structure is made up of high-strength steel and ultra-high-strength steel, which makes the Ford EcoSport’s frame especially strong yet lightweight. The new Ford EcoSport continues to be a benchmark offering segment best up to six airbags for an enhanced level of protection for the driver and as well passengers. The outstanding safety is further complemented with first-in-segment in-car technologies that allow drivers to stay conveniently connected with their digital lives. The EcoSport will continue to provide SYNC with AppLink, Ford’s advanced in-car connectivity system. SYNC with AppLink allows drivers to control their phone, entertainment and apps hands-free using simple voice commands. The clever and capable SUV ensures that help is never far in an unfortunate event of a collision. It offers Ford’s well-known Emergency Assistance feature that uses SYNC and a Bluetooth-paired phone to call emergency responders automatically and provide information about your vehicle and location. In India, AppLink allows drivers to access information about nearby attractions and food destinations with Explore by MapMyIndia and stay updated with the latest cricket scores and upcoming fixtures with ESPN Cricinfo. Launched in 2013, Ford EcoSport has continued to win hearts of customers and enthusiasts alike with its robust drive dynamics, exemplary performance along with smart technology and compelling value proposition. The compact SUV topped global automotive research firm J.D. Power’s Initial Quality Study in the SUV category for 2014. Let us know what do you think of new Ford EcoSport and its prices. Have your say by commenting below.